Each August, the historic city of Santa Fe, NM becomes the Santa Fe Indian Market, enveloping the town's central Plaza and surrounding streets. In addition, hundreds of gallery openings, art shows and related events take place during the weekend of Indian Market and during the two weeks immediately preceding it. Indian art collectors and artists from around the world make the pilgrimage to Santa Fe -- whether they intend to buy or not. The Southwestern Association for Indian Arts (SWAIA) sponsors the event, which is estimated to bring more than 80,000 people and over $100 million in revenues to the state and region. 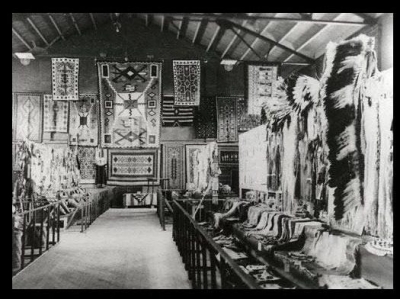 Now, 96 years after the first Indian Fair, the Southwestern Association for Indian Arts proud mission is "To develop, sponsor, and promote the Santa Fe Indian Market and other educational programs and events that encourage cultural preservation, inter-cultural understanding, and economic opportunities for American Indians through excellence in the arts, with an emphasis of Indians in the Southwest." As SWAIA enters the 21st Century with a world gaining deeper appreciation for American Indian arts and culture, it is poised for expanding its role through the creation of Markets worldwide, and through further developing its educational and training programs in support of Native American artists.